While closing down a business trip, which has had my full attention, with my off-time involving trying to recover from Shingles – a result of having a pain management treatment with Botox A, which is NOT cosmetic, it has been difficult to finalize this Series. My concern has been what will remain after this challenge – several scars are already noticeable on the right side of my face and damage to the eyelid. It is too early to tell yet if the optic nerve is damaged as is indicated by the blurry vision and whether or not the desensitization to hearing will be reversible in whole or part. It is imperative for us to grasp a hold of the person who is speaking, none other than the Son of God, with clear coverage of the challenges we may face and how to overcome them. To have no doubt is to be in full agreement with our Heavenly Father on the matter, at that time on the issue at hand – Trusting in Him by Faith – because we have met with Him in Prayer. We have to talk to Him to know what He wants us to know, has for us to become a part of and to see what we have to do for Him. We don’t want (should not) to move mountains for us, we should have desire to move those mountains because it would honor, obey and fulfill all we have to do with His Presence through us. In order to know His Heart — there must be a constant change in us, taken steps at a time, becoming more and more like Him. As we do so, the more easily we will forgive, the more difficult it will become to offend us and the more closely our words, deeds, thoughts, actions, desires and walk will be a more perfect, clear reflection of His Will becomes. Jesus gave us the parts and pieces as to how to accomplish this dedicated lifestyle with miraculous results that by Faith would occur. We must Pray, Believe, Forgive. Only then, can we even think about moving anything of significance, whether it be a fig tree in our lives or a mountain that changes the landscape for lives other than our own. Such a simple subscription, isn’t it? Much harder to do, but is something that each of us can have daily, hourly, by the moment – everything He would have us do, is not only possible, but is all within our capability when our heartbeat is in union with our Heavenly Father’s! What today has been accomplished and made possible because you Prayed, Believed and made sure all has been forgiven by you and of you by the Father? 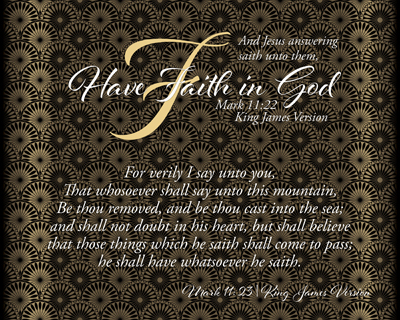 Oh, what we could do for Eternity’s sake if we would just have Faith in God! SPECIAL NOTE | Thank You Ms. Lydia, my flying neighbor on the way back from Nashville, TN to Raleigh, NC! We talked, discussed our kids, share philosophies on life and our Love for the Saviour Jesus Christ – with a time for this Series Introduction to spill out of me onto paper… Truly a Blessing to Share that Religion gets us nowhere, but our Salvation in Christ and Redemption Showing allows us to Know our Destination of Heaven to be with Him.